What is the piece of writing you see most often? What do you write most often? A signature. Even in these days of texting and email, just about everyone still has to actually write their name sometimes. And when you do, you are giving away a great deal about yourself. You may not be consciously aware of it, and neither may be another person who reads it, but subconsciously (just as all body language works) both you and s/he are understanding a great deal more about you than just your name. Even if your name is illegible, the body language is till at work. This little book takes you quickly through how to change your signature so it ‘says’ what you want it to say about you and this gives 3 benefits. One is the obvious one that other people pick up good vibes from your signature. The second is that you do too … and the third is that the more you sign your name this way, the more the personality indicated in the new signature becomes impressed on your own subconscious, and you will not only start to believe it, you will start to live it – to walk to talk – to become the person of your signature. What more could you ask of just 2 or 3 little words that spell out your name! Click on the image above, or the title below to go purchase from Amazon. 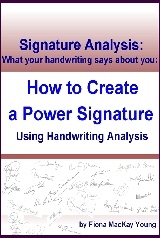 By creating a success signature you take advantage of the power of handwriting analysis as a personal development tool. You can develop the personality traits that you want, that will help you succeed, and your signature is an excellent place to start. Explanations, illustrations and clear instructions.